One slight puzzle that had me in a bit of a panic was that my attempts to find the truss rod to make some adjustments were entirely fruitless. Was this guitar sans truss rod? Has someone at the factory forgotten to put one in? I searched and searched with my wrench, feeling through the hole under the fingerboard, but without joy. I couldn’t believe it. I quickly emailed Jon and he advised that Martin had recessed their rods some. Some? Anyway, Jon sent me a longer wrench and the panic was over. Sonic characteristics? Well, the long scale and scalloped bracing make it a loud and projecting guitar. The rosewood provides an ocean of rich harmonics and a grumble in the bass that can be made to sound menacing with the right material. Driven, there is a wash of sound that nevertheless remains quite balance over the six strings – although I’m looking forward to a fattening of the trebles as the guitar opens up as it gets played. Playability? After a tweak of the truss rod, it plays just fine; so much so that I have been able to leave the saddle as per the factory set up. A minor quibble: the nut slots (again!) are cut too far apart bringing the top and bottom strings too near the edge of the fingerboard. I had asked Jon to check this aspect for me and he’d OK’d it, so can only assume that this is per Martin specification. Nevertheless, I assert that the string spacing at the nut should be less so that the top sting isn’t pulled off the fingerboard so easily ““ particularly with pull offs. It might be argued that this is more a reflection of my technique than a comment on Martin specs. but my view was endorsed by an authorised Martin repair technician in Glasgow with respect to my other OM. Another feature of the guitar is the strong smell of vanilla that exudes from the soundhole every time I pick it up to play. It really is quite intoxicating. For the first few days I had to open a bottle of Chianti just to balance things out. Pity. Interesting that you felt the nut was slotted too close to the edge of the fingerboard. I bought a wonderful new 000-18GE about a year and a half ago and had to ask a luthier to make a new cut for the high E string a little closer in for pull-offs. On the positive side, the instrument really opened up a lot over the first year, and with that Adirondack top has plenty of tonal range and volume. 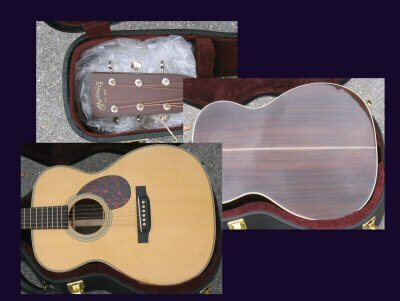 I’m in love with these 000’s and OM’s and would like to get a rosewood model someday. The Santa Cruz OMs are superb, too.